According to Deloitte, US consumer spending increased in June, reversing a recent trend. 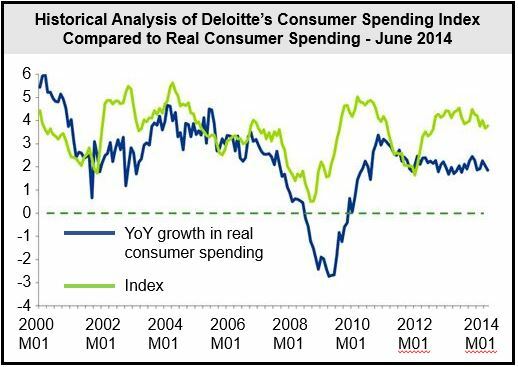 The Deloitte Consumer Spending Index monitors consumer cash flow as an indicator of consumer spending that is to come. Daniel Bachman, Deloitte’s senior U.S. economist, said rising house prices and a fall in unemployment claims have pushed the Index into positive territory, suggesting that consumers are both able and willing to spend. Real home prices: new home prices went up 4.2% compared to May’s $119,000, and by 2.6% in 12 months. Real Wages: real hourly wages rose by 0.5% compared to June 2013 to $8.81, but were lower than last month’s $8.82. The Tax Burden: is holding steady for the 7th consecutive month, with a slight decrease to 11.7%. Initial Unemployment Claims: declined by 8.5% to 313,000 compared to the same period in 2013, and fell 2.4% from May’s 320,000. The Index increased to 3.78 in June, compared to 3.67 in May. Deloitte says that retailers will ramp up their marketing campaigns during the back-to-school season, with promotions, attractive offers and distinctive events to drive traffic. Foot traffic refers to the number of people walking around in a given area. In June, US unemployment fell to 6.1%.